A NOVEL dual-sensor microscope camera from Olympus will produce both high-sensitivity monochrome (black and white) images and high-quality colour images, without the need to switch cameras. 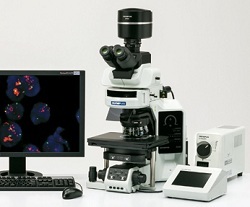 The Olympus DP80 has two separate CCD sensors, making it a versatile device which will increase the functionality on a single microscope stand. The colour sensor can produce 12.5 megapixel images using the ‘pixel-shift’ technique to boost the effective pixel count, and will find applications in brightfield microscopy. The actual sensor yields 1.45 megapixels at 1360×1025 pixels. The separate monochrome sensor, useful for fluorescence imaging, also yields 1.45 megapixel images. Olympus America says the DP80 is the only scientific-grade microscope camera currently available that provides this dual-sensor functionality. “The system is essentially two complete, high-performance parfocal and parcentric cameras in one. It is designed for researchers who previously needed to align two cameras to a dual port, such as scientists acquiring fluorescence images who also need to capture colour brightfield images for publication or reference purposes”, said Peter Mabanglo, product manager for Olympus America. Colour resolution is enhanced and sharper images are produced thanks to the fine detail processing mode, while in monochrome the camera promises high sensitivity for dim fluorescence images. In an intriguing statement, Olympus says that even users who currently require only colour imaging can benefit from the DP80 microscope camera. Because it offers the ability to step up to higher-resolution monochrome, users can expand and increase the flexibility and output of their system at any time. The company reckons the two-in-one camera provides higher performance at lower cost than any combination of competitive cameras offering similar functionality, even before considering the time and cost savings associated with not needing a dual-port adapter.